Damn if I don't write a Krude blog about New Jersey's finest musical export. Bruce Springsteen? No. Bon Jovi? No. Whitney Houston? No. Frank Sinatra? No. The Smithereens? No. All worthy,obvious choices. But not tops to Krude. I wouldn't be Krude if I chose a normal musical act to serve as my NJ's finest. So that narrows it down to a select few. Since I am very familiar with Lodi,New Jersey, the Krude nod proudly goes to the Misfits. There is nothing normal about the Misfits. This band was and totally is a DIY kind of band. They created their own logo,image,records,fan club etc. Their music sounds like no other band of that time. All this was being birthed in the late 1970's by a group of Lodi,NJ dudes with a penchant for horror movies,lifting weights,and Rock n' Roll. Only possibly the Ramones have gotten more merch mileage out of their logo than the Misfits. If I had a dollar for every time I have seen somebody wearing a Misfits logo somewhere on their being,I'd be a Hundred Thousandaire. As with the Ramones,ask the person wearing the Misfits merch to name 5 songs from the artist they are sporting. Doubt they can. But that is ok. 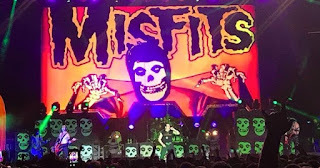 Seeing a Misfits logo always makes Krude smile. Regardless of the hapless phony trying to be edgy. The Misfits music is the true key to their legend. Glenn Danzig is one hell of a songwriter and one heck of a lead singer. The songs are often sung unlike a typical rock/punk way. Glenn is a true crooner with the vocal chops of an opera tenor. The tunes are simple,energetic, 4 or so chords, punky gems. Lots of 'whoa' s going on too. So catchy these songs are that Metallica chose to cover a few in their early, thrashery days. 40 years is a long time for anything. But for the Misfits,time has been very good to them. 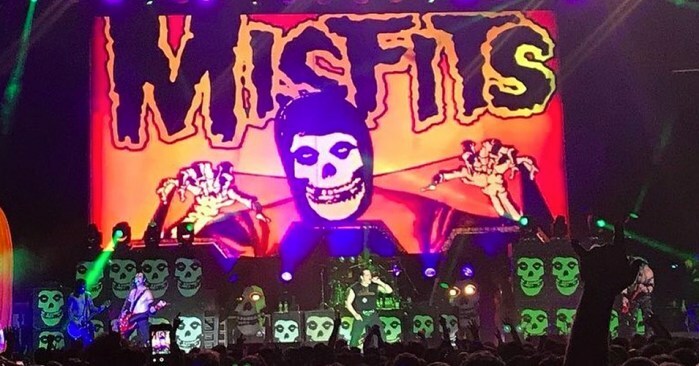 A recent Misfits "reunion" show with Glenn Danzig,Jerry Only,Doyle with Dave Lombardo sold out a local NJ arena's 17,000 seats instantly. Mariah Carey couldn't even sell half that number at the same arena recently. Impressive feat by the Misfits,to say the least.